Welcome home folks! Former builders show home this is one you must see open floor plan. 2 Bedrooms plus Den and 2 baths Beautiful oversized tile floors in the living areas,tile throughout. Kitchen has eating space and a pass thru to the dining room. Updated Kitchen and appliances Sliding glass doors from the living room and the master bedroom open to the covered Florida room with tinted windows with screens, ceiling fans and A/C vents. Electric sscreened in garage. Large master bedroom with walk-in closet. 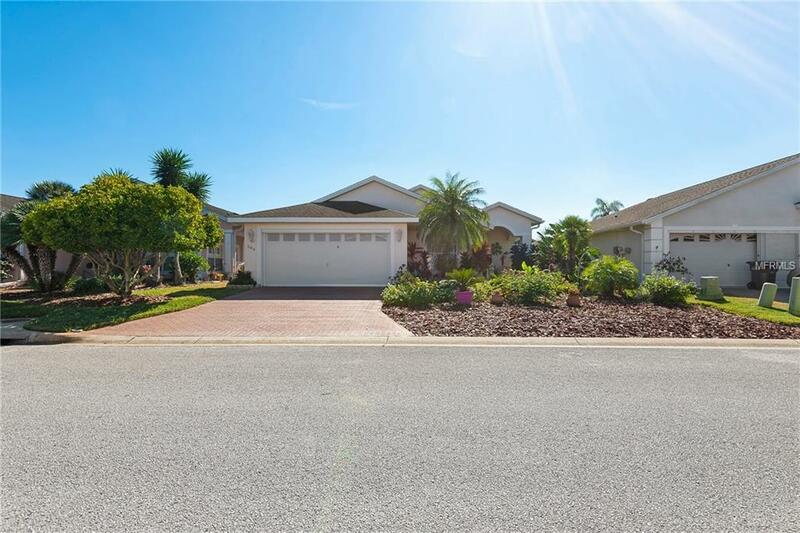 Master bath has two sinks and a large shower.. Ridgewood Lakes is a gated, golf course community with gate attendants 24/7. The community clubhouse has a large ballroom, library, card room, fitness center, arts and craft room, planned activities and a unique pub and game room. Outside is a huge heated pool and hot tub, shuffleboard, bocce ball, pickleball and tennis courts.